Massive news! LEGO Harry Potter is coming back this year! Early this morning, news was released about the return of a theme based around the world of both the Harry Potter and Fantastic Beasts films, which will be released on August 1. 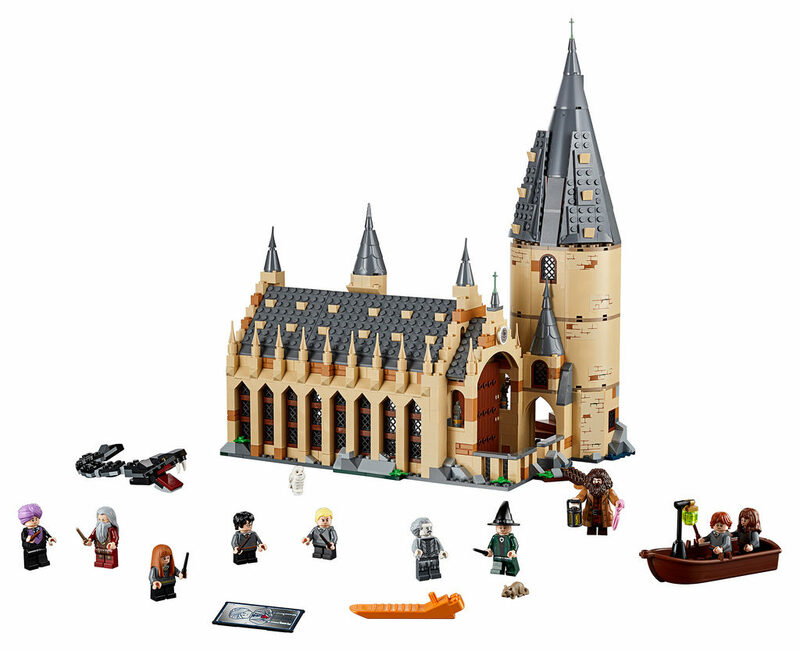 This is ridiculously exciting for me, as I was in my Dark Ages when the original LEGO Harry Potter theme was available. I can finally get my hands on some! All of the students have the shorter leg elements, as at the start of the series they were still so little! I think this is a clever move, although it does limit poseability. The five (yep, five) students include Harry, Ron and Hermione, as well as Draco Malfoy and Susan Bones – a Hufflepuff student for the very first time! That means a new print! The staff include Professors Dumbledore, McGonagall and Quirrell (who’s also got Voldemort on a reversible head), a brand new Hagrid, and another new character, Nearly Headless Nick. Representing the creatures we have Hedwig the owl, Scabbers the rat (another new mould), and a buildable Basilisk and Fawkes, Dumbledore’s phoenix. Inside the Great Hall are a tonne of details and new elements. Starting in the tower, we’ve got the Mirror of Erised, a new Sorting Hat mould, and a moving staircase, using what I think are still the best spiral staircases LEGO has done. Details inside the hall include reversible house banners and new “floating” candle elements which all look beautiful. I love the printing for the banners – the creases and folds look great. I’m really excited to check out those candle elements! 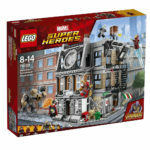 It appears that this set will also connect with other sets, due to the Technic pins built into the wall. Looking outside, There’s immediately a big change – the sand green roof from previous sets is gone, and a dark grey gets the nod, matching with the film’s iteration of the school. In saying that though, there are still a couple of sand green elements included – the ski poles. There are the new leaf elements which have already been seen in a bunch of Friends sets. There are new 1×1 triangle elements on the roof, which will be great to use in other models, and unicorn horns, spear tips, nanofigures and more. 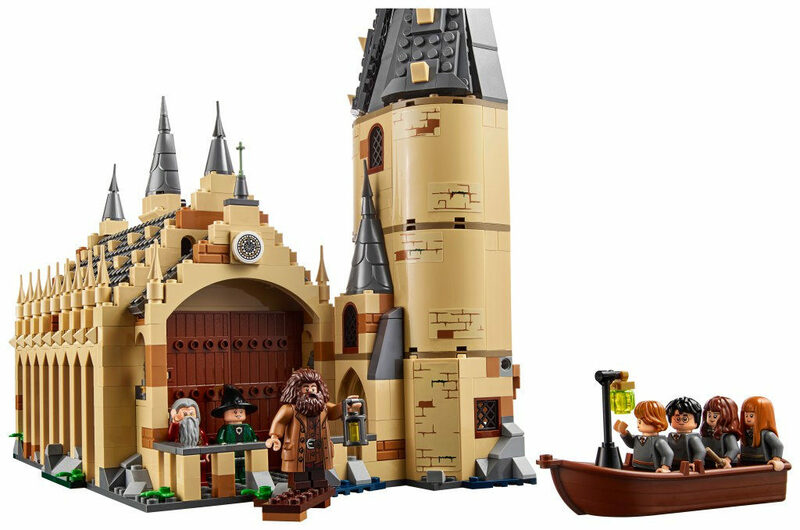 It also looks like Hagrid is holding not only a recoloured pink umbrella, but a new lantern piece! 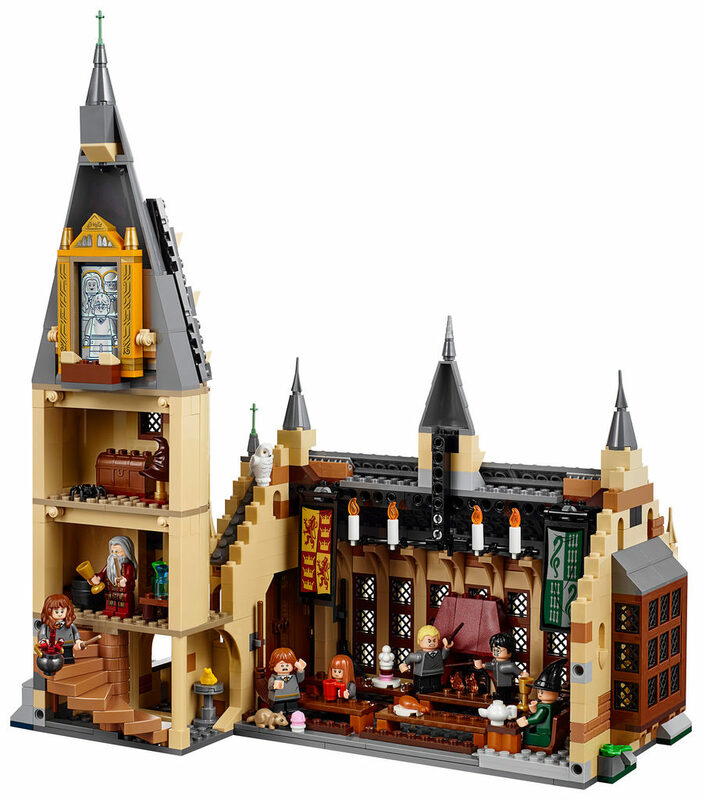 You can read the full press release for the first 2018 LEGO Harry Potter set below. 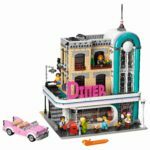 I am so ridiculously excited about these sets! 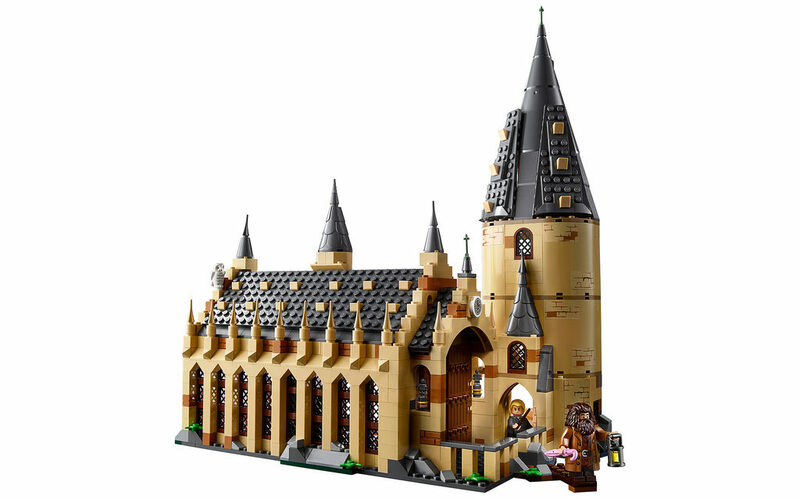 Who else is keen to get back into the LEGO Harry Potter series? Let me know what you think!